Mitchel Air Force Base, New York U.S.
William Edward "Bill" Fichtner, Jr. (born November 27, 1956) is an American actor. He has appeared in a number of notable films and TV series. He is known for his roles as Sheriff Tom Underlay in the cult favorite television series Invasion, Alexander Mahone on Prison Break, and numerous film roles, including: Quiz Show, Armageddon, The Perfect Storm, Crash, Blades of Glory, Black Hawk Down, Nine Lives, The Longest Yard, Mr. & Mrs. Smith, The Dark Knight, Date Night, The Lone Ranger, Phantom, Elysium, Independence Day: Resurgence, and Teenage Mutant Ninja Turtles (2014). Fichtner was born on Mitchel Air Force Base on Long Island, and was raised in Cheektowaga, New York, a suburb of Buffalo. He is the son of Patricia A. (née Steitz) and William E. Fichtner. He has German ancestry. Fichtner graduated from Maryvale High School (Cheektowaga) in 1974. After graduating from Farmingdale State College in 1976 with an associate degree in criminal justice, he attended SUNY Brockport and earned a Bachelor of Arts degree in criminal justice in 1978. Fichtner then studied at the American Academy of Dramatic Arts in New York. Fichtner credits his Farmingdale State College admissions counselor, Don Harvey, with his decision to study acting. Harvey, who became a lifelong friend, took Fichtner to his first Broadway show. On May 18, 2008, Fichtner was awarded an Honorary Doctorate of Humane Letters by Farmingdale State College. Fichtner began his acting career as Josh Snyder in As the World Turns in 1987. Fichtner's film credits include Contact, Heat, Armageddon, Go, Equilibrium, Black Hawk Down, The Perfect Storm, The Longest Yard, Crash, Ultraviolet and The Dark Knight. Mainly a character actor, one of Fichtner's few leading roles is in Passion of Mind, also starring Demi Moore and Stellan Skarsgård. For his role in Crash, he won a Screen Actors Guild Outstanding Performance Award and a "Best Acting Ensemble" Award from Broadcast Film Critics Choice. 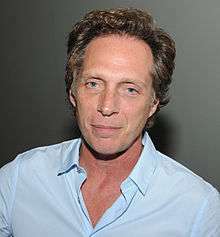 Credited as Bill Fichtner, he voiced the character Ken Rosenberg in the video games Grand Theft Auto: Vice City and Grand Theft Auto: San Andreas. Between 2005 and 2006, Fichtner also starred in the science-fiction TV series Invasion as Sheriff Tom Underlay. After Invasion was canceled, Fichtner played FBI Agent Alexander Mahone in the second through fourth seasons (2006–2009) of Prison Break. Later that year, he presented an award at the National Hockey League award show. He also appears in The West Wing episode, "The Supremes" as Christopher Mulready, a conservative judge nominated to the Supreme Court. Fichtner also had a role as the Gotham National Bank manager in the feature film The Dark Knight, and as Jurgen in Equilibrium. In June 2009, Fichtner signed on to guest star on Entourage playing TV producer Phil Yagoda, who is trying to remake his hit 1990s teen series. He also voices Master Sergeant Sandman in the 2011 video game Call of Duty: Modern Warfare 3. Fichtner played Eric Sacks in Teenage Mutant Ninja Turtles (2014). As of June 2014, Fichtner lives in Prague, Czech Republic, where he filmed the television series Crossing Lines. Fichtner is a fan of the National Football League (NFL)'s Buffalo Bills, appearing in a commercial for the team before the 2014 season. More recently, Fichtner narrated the ESPN 30 for 30 documentary titled Four Falls of Buffalo, chronicling the Buffalo Bills' four consecutive Super Bowl appearances from 1990–93. Baywatch Howard Ganza Episode: "Rookie School"
2004 The West Wing Christopher Mulready Episode: "The Supremes"
American Dad! Harland (voice) Episode: "Homeland Insecurity"
↑ "William Fichtner Biography (1956-)". FilmReference.com. Retrieved June 18, 2013. ↑ Silverman, Stephen M. (2002-01-17). "'Black Hawk Down' Comes Up in D.C.". People. Retrieved 2012-04-03. ↑ David Niles. "Worcester Telegram & Gazette Archives". Nl.newsbank.com. Retrieved 2012-04-03. ↑ The Post-Journal (2009-12-29). "Patricia A. Fichtner - post-journal.com | News, Sports, Jobs, Community Information - Jamestown". Post-Journal. Retrieved 2012-04-03. ↑ "FAQs and Q&A with William Fichtner". WilliamFichtner.org (official site). Archived from the original on June 18, 2007. Retrieved 2012-04-03. ↑ "About William Fichtner". Farmingdale State College. 2006. Archived from the original on September 27, 2011. ↑ Clean 'Break' for Fichtner Reuters. June 19, 2006. Retrieved June 19, 2006. ↑ "Entourage Admits Caan, Fichtner, Letscher". TVGuide.com. Retrieved 2009-06-08. ↑ Gaudiosi, John (2011-04-11). "Actor William Fichtner is Modern Warfare 3's Sandman". IGN. Retrieved 2011-04-11. ↑ Fichtner, William (September 4, 2014). VIDEO: What It Means to Be a Bills Fan. Buffalo Bills. Retrieved January 9, 2016. ↑ "Forehead Tittaes w/ Marion Cotillard". Funny Or Die. 9 March 2010. ↑ "A Father for Charlie (1995)". FamousFix. ↑ Kaufman, Alexander C. (4 October 2012). "National Geographic Channel to Show Osama bin Laden Thriller 'Seal Team Six'". TheWrap. Wikimedia Commons has media related to William Fichtner.